The plan has been since last fall that I was going to dedicate the month of January to working on the magazine exclusively. I knew there was going to be a lot of editing and design work that I couldn’t get done in my “spare” time alone. Also, the public excitement about M&T really forced me to step up my game and make this thing as polished as I reasonably could achieve with the time and resources I had at hand. Giving M&T this concentrated January time worked out well with the exception of one thing: it’s still not over. As we were packing magazines and dropping off van load after van load at the Post Office last month, things began picking up rather than slowing down. It seems that once readers began getting their copies and showing them off on social media others began to get jealous to see what they were missing out on. The orders spiked and I’ve barely been able to keep up since. 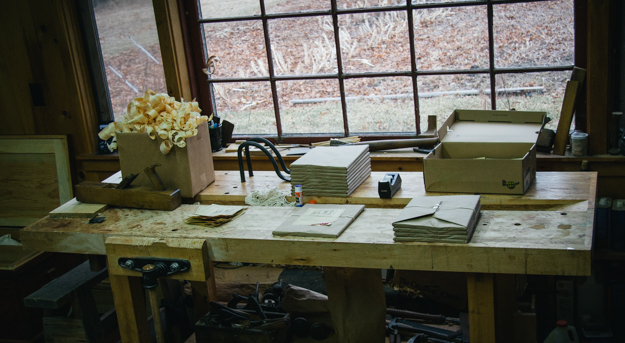 For weeks now, I have been full time answering emails, packaging magazines, and shipping orders out. Now, don’t get me wrong here: I’m not complaining but it was never supposed to be like this. When I began this project I hoped to sell maybe 1,000 copies when all was said and done. That would be decent for a small start-up independent publisher and would be considered a success in my book. But as momentum was gaining the past few months, I decided to bump up the print run to 5,000. Because I want to keep Issue One in stock I thought this would be a safe number to cover me at least for a few years. Turns out I was wrong. Right now, only a few weeks after hitting mailboxes, Issue One is almost completely sold out. I am currently working on a second run of Issue One but it might be a month or so before I see that delivery. If you want a copy but still haven’t ordered, I recommend you get it now before it’s out of stock temporarily. Waiting to hear back from me? So if you have been waiting a few days to hear back from me with your order inquiry through email, please be patient. This thing is way bigger than I anticipated and definitely way more than one person can handle. I will get back to each and every one of you as soon as is humanely possible but as of right now Mortise & Tenon Magazine consists primarily of one person. I am in the early stages of training help but it’ll be a few weeks before that transition is smoothed out. For now, I’m trying to keep my head above water solo. Thank you all for your humbling support and near embarrassing enthusiasm. I feel so fortunate to be able to share the research and work I am passionate about. As I gain more experience overseeing the ins and outs of running a magazine, I am confident things will become much more manageable. And with hired help, I hope to see this operation running as smooth as any independent publisher could expect, even if it is (literally) a kitchen table publication in the meantime. Glad to hear that M&T is such a huge success. Joshua! On my this great news. A potential second run. Well I can tell you this, don't stress, the magazine speaks for itself. Customers just need to be patient. God bless. Thank you, Freddy. It's hard not to stress. I'm trying to make sure everyone is taken care of in a timely way but it's a lot of work! Well if you are going to do a second run I want a copy from that print as well. Got my copy a couple weeks ago,.. liked that it came packed in shavings. And i was able to preserve the label with the Sealing Wax Medallion on it. I enjoy a little every evening. Not going to rush through it. Keep up the good work Joshua, it's great to see it coming to fruition. This is awesome. :) Grats, Joshua. Slowly making my way through it. Trying to enjoy and absorb at the same time, as I have a lot on my plate these days and don't have as much leisure time as I used to. Sounds like you're in the same boat, though... It's not a bad place to be in. Hats off to you Joshua! I will definitely get one. Will let you know when I've got mine. Keep up the good work. Cheers! It deserves to be a success It's an awesome publication, everything I thought it would be and more!! Joshua, Don't forget to take a moment and be proud of yourself for a job not only well done, but a job done in an extremely excellent manner! I am so glad you did this for us, allowing us to share in your work. Thank you very much! What a catch-22...I mean here you wanted success and wondered if the magazine would live up to that. And now you wonder if you will live up to the success of the magazine. In the event there are more ways to interpret what I'm saying I mean - congratulations on a great magazine and here's my wishes that you can do what you need to to get it to everyone and get back to your life. Hopefully with some very hard earned cash. I too am reading it slowly but was very impressed with your teardown of the card table. I read that so slowly along with the pics to make sure I understood what you learned that I felt like I actually worked along side you.